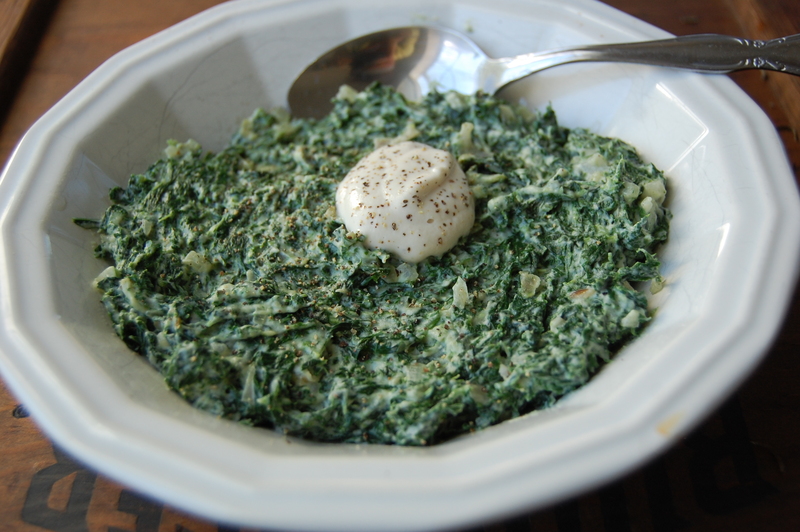 Vegan Creamed Kale - Are You Kitchen Me?! A few months ago, John and I drove up north to visit his lovely grandparents. 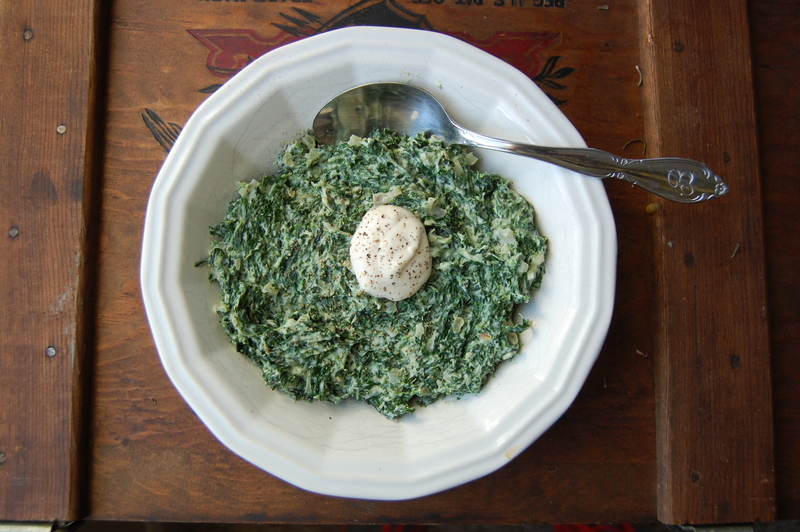 They asked us to help with dinner and requested that I make creamed spinach- a family favorite. I’d never made it before but Grandma Joy had a recipe and all the fixins ready to go. 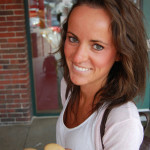 She assured me that it wasn’t difficult and came together pretty easily- and she was right! Plenty of cream cheese, whipped egg whites, frozen spinach, and love went into the dish which got baked in the oven until it was a light golden brown and smelled divine. I was pleased that the dish came out delicious and everyone liked it but if you know me at all, you know I’m always one to try things my own way. In light of my recent decision to start limiting dairy and eggs, I thought it would be fun to experiment with a vegan version of this classic. Let me tell you what, this Vegan Creamed Kale is SO. GOOD. I won’t say that it’s better than grandma’s recipe- duh- but I will say that I’ve made this five or six times and #cantstopwontstop. John gobbles it up what makes it to the plates since I tend to devour most of it straight from the pan… It even makes a regular appearance in both our lunch boxes and was a hit at Thanksgiving! This is a great twist on a classic American comfort food dish that will satisfy even those who aren’t wild about “healthy” options. Let’s talk about the base of this recipe real quick. 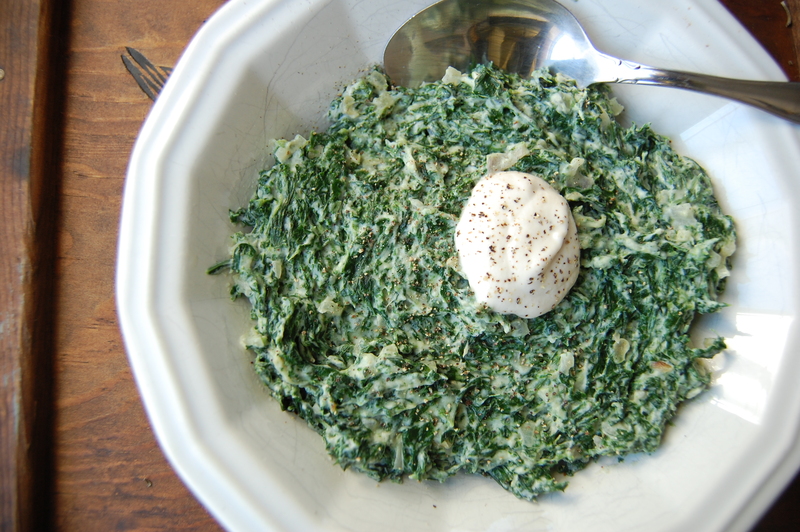 How do you make creamed kale without cream?! Well… You make cashew cream. And then you eat it all with a spoon. I mean, keep it in the fridge and stare at it longingly. Cashews are sooo fantastic because they are soft and creamy and blend up so smooth (*ahem* cashew butter. holy yum. coming soon). Soaked in water overnight, they plump up and are even easier to pulverize into creamy submission. How many times can I say creamy in one post? Creamy. Ok I’m done… Cashew cream isn’t necessarily a lower fat option than regular cream but because it is plant-based and homemade from ONE ingredient, I’m way more ok with the indulgence. A vegan twist on an American classic, this vegan creamed kale was inspired by a grandmother's recipe. You won't miss the heavy cream but you will miss this dish when it's gone! To make cashew cream, add cashews (soaked at least 4 hours, overnight is best) and 1 cup of water to blender or food processor. Blend for three minutes until very smooth, adding more water tablespoon at a time as needed. If small pieces remain, blend for one or two minutes more- the consistency should resemble that of regular cream. Heat a pot of salted water over high heat until boiling and add kale. Return to boil and cook for 3 minutes until wilted. Pour contents of pot over a colander and drain. Let cool a few minutes and squeeze kale until little liquid remains. Move kale to cutting board and chop. Set aside. To a large skillet, add the olive oil and heat over medium heat. Once hot, add shallots and gently sauté for 8-12 minutes. When shallots are soft and translucent (but not browned) add in kale, lemon juice, nutmeg, miso, and cashew cream. Stir well and sauté for one or two minutes, adding pepper and salt (as needed- careful, miso is very salty!). Transfer to a large bowl or baking dish to serve. This dish does well covered in a low-heat oven to keep warm. Enjoy!